I am keen to start gaming with the Wood Elves part of the HighWood army, but I need a fair number of troops before I can start. So this week I have started to tackle the units of dryads. There will be 3 units of 10 each, lead into battle by this branchwraith. 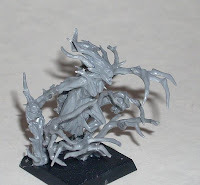 I have also assembled one of the units, just another 20 dryads to go. Once these are built, I can add them to the Elves already painted, plus a few proxies, to get in a first game with the tree-huggers. 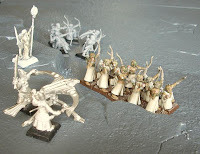 Here's the first instalment of my latest army, the Elves of Highwood. The idea is to paint elves that can be used as either High Elves or Wood Elves. The background for the High Elf army is that it is based in or around Avelorn, where the elves are similar in appearance to their sylvan cousins. When I play them as High Elves, these are 10 archers, 5 shadow warriors and a mage. When I eventually have enough models to make a Wood Elf army, they will be 10 glade guard and 5 scouts (the mage is a High Elf only model, I have a purely wood elf model as her counterpart still to be painted). The next phase will be High Elf only models as I am currently playing them in a Mighty Empires campaign. I am using some of my older models, supplemented by these new Avelorn troops, alongside some Chrace special troops. I am hoping to get one or two units like these painted up each month. One of the busiest hobby weekends for a long time. On Friday night my orks played the marines, on Saturday afternoon my dwarfs took on the Orcs, and on Sunday I built a little unit to place into the painting pending pile. The game on Friday was a good one, with 3 objectives to battle over. My orks managed to wrestle one from the marines, just a handful of ard boyz emerging from the wreck of an exploding trukk to beat some nearby assault marines into a pulp. With the help of burna boyz, they managed to clear the marines and hold the objective. One squad of boyz was obliterated in bolter fire, but the warboss and a lone deffkopta remained to contest a second objective. The third objective was held by a small unit of gretchin, a late landspeeder dash to contest it was foiled by a lucky big shoota bullet sending it spiralling into the dirt. The Saturday afternoon game was a historic one for me - the first use of my new gameboard. I managed to get a couple of half-painted models finished in the morning, so it was a fully painted 2000 point dwarf army I was fielding. I felt bad placing four pieces of artillery on the board, but my opponent did the same and more. His army contained four magic users which completely overwhelmed my single runesmith. The dwarfs suffered a lot of casualties to magic and artillery, the rock lobba being particularly accurate and accounting for many an ironbreaker. In contrast, my own artillery had one decent turn, then misfired or missed. In turn 2 I misfired the cannon, rerolled for the rune of forging, which misfired again, then rolled a 2, taking the cannon out of action for two turns. The flame cannon then misfired and I rolled a 1 - boom went my freshly painted model! Things looked grim for the bearded folk. But when combat was eventually joined the dwarfs weathered the charge, as they so often do, then beat the orcs in the next turn and chased them away. The longbeard unit managed to flank charge a unit of savage orcs (which had been lured out of position by a depleted but brave unit of thunderers). They ran them down, but then braced themselves for a charge from a unit of boarboys. The greenskins failed their animosity test and the longbeards were able to get a second charge in, a very rare occurrence for me as a dwarf player. Not only that, they beat them, and then managed to run them down too! I think that's a first for my dwarfs, catching a fleeing unit of cavalry. The captured banners swung the game my way and I was able to record a minor victory in this historic encounter. I was so fired up by the return of the beards that the very next day I unearthed my dwarf collection and cobbled together some rangers. I have always wanted to include the metal ranger champion model, one of my favourite dwarf models of all time. I really wanted to make a unit of grizzled veterans in the same vein, but I can't find enough models for that, so I have settled on the plastics as shown in the photo. There's a couple of the older style dwarfs in the regiment, with the newer hands they look quite reasonable. I have no idea when I will get my first game with the rangers, let alone paint them, but I just had the itch and had to scratch it. What an exciting day - and it's still only lunchtime! I went for a walk with this morning up a small local, wooded hill. I have been dozens of times, it's nice to get up off my painter's arse every once in a while, get some fresh air and exercise, all that kind of thing. Walking through the trees a pair of birds came straight at us, I thought they were woodpigeons but no, it was a pair of sparrowhawks. Magnificent sight! A bit further along I spotted a movement up ahead - it was a roe deer. I have walked this path for about 8 years and it's the first one I have ever seen. It's kind of magical when you see them in the wild, rather than on TV. And the wildlife hat-trick was my walking buddy pointing out that the bird calling in the distance was a whimbrel, a curlew like bird, migrating to distant lands. Okay, not quite as exciting as being buzzed by sparrowhawks or tracking a deer, but they are quite a rarity I am informed by my bird buddy. What's all this to do with gaming? Nothing really, though there is a tenuous connection. My Realm of Battle gameboard arrived today and I put it together as soon as I returned from the hike. I had some elven archers near at hand and tested them on the board, they do not slip down the slope, which was one of my fears. The picture shows them and the next few elves that will join them. These are the first units of the HE-WE army - an army that will be playable as either High Elves or Wood Elves. Or the Elves of Highwood. And that's the circle complete, the walk in the wood, the wildlife, the battle board, the elf army. Sometimes, these things come just seem to come together like this. Maybe next time I go for my walk, I will see a dryad or a white lion.